Pictured above L/R: Michael " The Sheriff " Sheils, Dominic Hannigan TD for Meath East and presidential candidate Michael D Higgins. 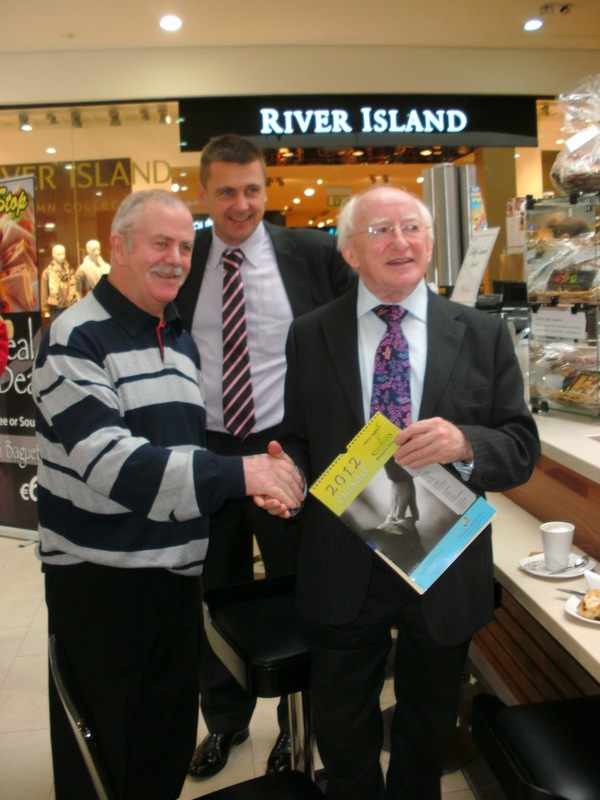 When presidential candidate Michael D. Higgins, visited Navan, on Tuesday 11 October I presented him with a 2012 Calendar which was published a week earlier by the Small Impact Writers' to raise funds for the Drogheda Homeless Aid. I told Michael D, that I hope to see the calendar hanging in the Aras when I visit there. Navan Mayor CLLR Anton McCabe, accompanying Michael D. Higgins on his tour of Navan, with Meath East, TD Dominic Hannigan in the background. Michael " The Sheriff Sheils " and Michael D. Higgins, with Dominic Hannigan TD keeping an eye on things.